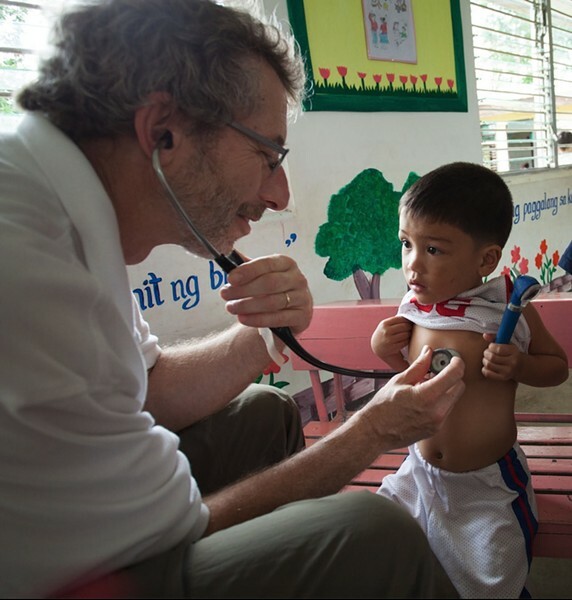 Dr. Barry Finette evaluating a young patient in the Philippines. In 2014, physicians Barry Finette and Barry Heath, both professors of pediatrics at the University of Vermont College of Medicine, launched a new global health care company. THINKmd would address a health crisis that plagues much of the developing world: Each year, more than 6 million children under age 5 die from treatable respiratory ailments because they lack access to pediatric-trained medical professionals. Their solution was to create a mobile medical platform that enables unskilled health care workers in the field to triage, assess and treat kids in respiratory distress. The product they developed, MEDSINC — short for Medical Evaluation and Diagnostic System for Infants, Newborns and Children — was first field-tested in Bangladesh in April 2015 with positive results. Now, THINKmd, a Burlington-based Vermont benefit corporation — a type of for-profit business entity with a legally mandated social mission — has signed a memorandum of understanding with Winooski-based Physician’s Computer Company to bring MEDSINC to market here. The reason: Many regions of the United States, including rural areas of Vermont, suffer from a shortage of pediatricians, and MEDSINC could be useful in bridging those gaps. Finette, THINKmd’s CEO who also serves as director of UVM’s Global Health and Humanitarian Opportunity Program, explained that THINKmd’s focus remains the same: “to expand health care equality by increasing access to health care.” THINKmd partnered with PCC founder and president John Canning, who’s also THINKmd’s chief technology officer, to create a domestic version of the platform. Canning, who was instrumental in MEDSINC's development, hopes to bring it to market in the United States. “When developing this platform with the THINKmd team, it became obvious that the health care issues we are attempting to solve in resource-poor countries hadn’t been solved in the U.S. health care market,” Canning said in a written statement. The U.S. version of MEDSINC will function much the same way as the one used in developing countries, Finette explained. Downloadable onto any smartphone or tablet, it provides a user who has little or no medical training with a questionnaire for assessing a sick child. The software then determines the severity of the child’s condition and recommends treatment options based on the user’s skill set and the equipment and supplies available. The MEDSINC platform made available in the U.S. market probably won’t advise treatment options, Finette noted, because that would require an extensive approval process by the U.S. Food and Drug Administration. The data gathered from the patient would be transmitted to a doctor’s office, a clinic or an emergency room, allowing staff there to make a speedier patient assessment. They might advise a parent to keep the child at home, come to the office or go directly to the nearest emergency room. Finette envisions the U.S. version will also include a telemedicine-type video component, which would allow the pediatrician or emergency staff to assist the patient remotely. The original MEDSINC product has already been field-tested and validated in Ecuador, Peru, Bangladesh and Burkina Faso. THINKmd now has commitments from UNICEF to continue the field testing. The international aid group Save the Children plans to deploy it in more areas of Bangladesh. According to Finette, the feedback they’ve received thus far on MEDSINC — from the unskilled field workers all the way up to national ministers of health — has been “overwhelmingly positive,” and thus attracted the interest of other international aid agencies that want to get on board. “They think the product is easy to learn. It dramatically increases their capabilities to assess children and give them treatments,” he said. By design, MEDSINC is usable on any smart mobile device. Once downloaded, it doesn’t require ongoing internet or wireless access. The only function unavailable without internet access is the data-upload component. Instead, all the patients’ data is stored on the device itself for upload later. MEDSINC's data-gathering has long-term value beyond just the treatment of a patient, Finette explained. It can also be used as public health data that’s not normally available in many countries. As Finette explained, all MEDSINC devices are GPS tagged, which makes them useful for predicting, identifying and locating disease outbreaks sooner. It also allows local public health officials to monitor and evaluate the users themselves, such as how many patients they’re seeing, how quickly they’re seeing them and what treatments they’re providing. Such data is valuable to international aid groups trying to improve their management of medicines, equipment and other supplies. “So, there’s a lot of value to all that data,” Finette added — in developing countries and here at home.